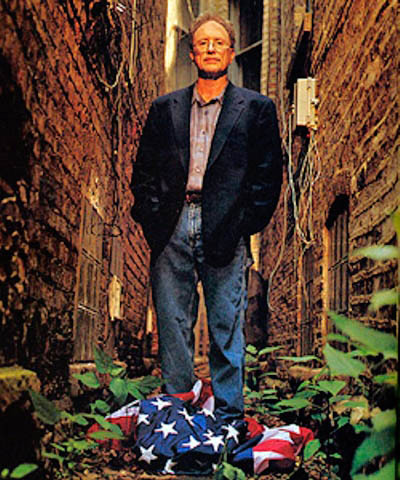 According to Tom Brokaw, William Ayers who is shown here desecrating the American flag is just a school reformer in Illinois, nothing more. He used to be a domestic terrorist. Now he is an educator. What do you think his idea of a curriculum for children is? The picture was taken in 2001 when this man was on the Board of the Woods Foundation. This entry was posted in 2008 Presidential Campaign and tagged Barack Obama, Tom Brokaw, William Ayers, Woods foundation. Bookmark the permalink. By the way, talk about bias, I am reading the article you linked to. Brokaw didn’t say that he was just a reformer. He mentions his association with the Weather Underground and how he is now a reformer. So unless you are insinuating that Ayers is still a domestic terrorist or something other than what he is, I’m not sure what you’re trying to do other than make insinuations hoping that I, as a reader, will come to your conclusion. Should I stop reading this blog if I want to get an honest assessment of the facts about the election? This is still a free country and you are free to draw your own conclusions. I am pointing out that this university professor and school reformer was “reforming schools” at the time he was desecrating the American flag. If you wish to read what he has said about education and about his involvement with various causes and individuals, you can do your own research.